On 25 August 1876, Robert Louis Stevenson and Walter Simpson began their canoe trip through Belgium and France. This was to be a 200 mile journey which was plagued by bad weather – it rained almost every day of their trip. 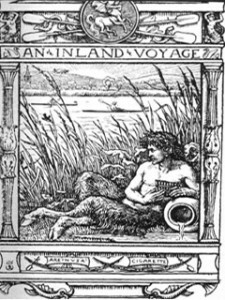 You can read about their journey in Stevenson’s An Inland Voyage (1878). On this page you will find the route that RLS and Simpson took: the information from late August onwards contains details about their travels through rivers in northern France. RLS and Simpson begin their journey at Antwerp. RLS and Simpson make their way along the Willebroek Canal to Boom where they stay in the Hotel de la Navigation. They next approach Laken (RLS refers to it by its Dutch spelling Laeken), where the rain lets up. They come to the threshold of Brussels, but find nowhere to put their canoes for the night. Friendly members of the Royal Sport Nautique allow them to store their canoes in their boathouse. They also show them to a hotel where RLS and Simpson spend the night. In Brussels RLS and Simpson decide to take the train to Maubeuge in France where they will take to their canoes again (RLS points out that one deciding factor is the presence of 55 locks between Brussels and Charleroi – the men would have had to spend most of the time portaging the canoes between them if they had not taken the train). RLS and Simpson stay in the Hotel Grand Cerf, in Maubeuge, while they wait for their canoes to arrive. In Maubeuge, RLS and Simpson take to their canoes in the River Sambre, travelling to Hautmont. In the evening they come to the lock at Quartes, where they leave the canoes to search for lodgings for the night. They walk from Quartes to Pont-sur-Sambre where despite the innkeeper confusing them for pedlars (a regular occurrence during this journey), they stay the night. In the morning, RLS and Simpson walk back to Quartes to fetch their canoes, leaving their bags at the inn. They return to Pont-sur-Sambre for their belongings, and then begin their day’s journey along the Sambre. They pass the forest of Mormal (Foret de Mormal) and make their way to Landrecies, where they stay the night. The weather in Landrecies is so bad that they stay a further day and night here. They find it a dull place, with little to visit besides the hotel and the café – although they do visit the church. In the evening they dine with the Juge du Paix. In the morning RLS and Simpson leave Landrecies and travel along the Sambre-Oise canal (connecting the River Sambre at Landrecies and the Oise River at Tergnier. RLS and Simpson put their canoes in a cart at Etreux. The men follow along, seeing the pleasant villages as they pass, such as Tupigny. They launch the canoes into the Oise at Vadencourt, Aisne. The Oise is so swollen and wild from flooding, however, that RLS’s canoe is swept away while he clings to a tree. By nightfall, they reach Origny Sainte-Benoite, where they spend the night. RLS and Simpson spend the day and night in Origny-Sainte-Benoite. In the morning RLS and Simpson leave Origny, following the Oise to Moy (full name Moy-de-l’Aisne). In Moy they stay at the Golden Sheep inn. RLS and Simpson travel from Moy-de-l’Aisne to La Fere, arriving in the evening. Unfortunately, they are turned away from an inn they had been looking forward to visiting. They wander disconsolately for awhile, at last coming upon an auberge run by M. and Mme Bazin. They spend a happy night there, in the genial company of the Bazins. “Here I am you see, and if you will take to a map you will observe I am already more than two doors from Antwerp whence I started. I have fought it through under the worst weather I ever saw in France; I have been wet through nearly every day of travel since the second (inclusive); besides this, I have had to fight against pretty mouldy health: so that, on the whole, the essayist and reviewer has shown, I think, some pluck” (Letter from RLS to W.E. Henley, 6 September 1876, The Letters of Robert Louis Stevenson, ed. by Bradford A. Booth and Ernest Mehew, vol ii [New Haven: Yale University Press, 1995], p. 188). “In the little pictorial map of our whole Inland Voyage, which my fancy still preserves, and sometimes unrolls for the amusement of odd moments, Noyon cathedral figures on a most preposterous scale, and must be nearly as large as a department. I can still see the faces of the priests as if they were at my elbow, and hear Ave Maria, ora pro nobis sounding through the church. All Noyon is blotted out for me by these superior memories; and I do not care to say more about the place” (RLS, An Inland Voyage [Boston: Robert Brothers, 1890], pp. 195-96). They stay in the Hotel du Nord. RLS and Simpson leave Noyon. The weather is particularly miserable and they stop for lunch at an inn at Pimprez. They now join the Aisne river (which is the left tributary of the Oise) and arrive in Compiegne as the sun is setting, staying in a hotel there. “I do not know that I would have stuck to it as I have done, if it has not been for professional purposes; for an easy book may be written and sold, with mighty little brains about it, where the journey is of a certain seriousness and can be named” (Letter from RLS to his mother, 9 September 1876, The Letters of Robert Louis Stevenson, ed. by Bradford A. Booth and Ernest Mehew, vol ii [New Haven: Yale University Press, 1995], p. 189). From Compiegne, RLS and Simpson make their way to Pont-Sainte-Maxence, staying the night there. In the morning, RLS goes to the church at Pont-Sainte-Maxence. He and Simpson then return to their canoes, stopping for lunch at Creil. In Creil RLS also visits the church. From Creil, RLS and Simpson paddle to Precy, arriving at sunset. They stay the night at an inn in Precy, “the worst inn in France” (RLS, An Inland Voyage [Boston: Robert Brothers, 1890], p. 238). At Precy RLS also watches a rather bad marionette show. RLS and Simpson continue their journey but RLS leaves the details vague: “Of the next two days’ sail little remains in my mind and nothing whatever in my notebook” (RLS, An Inland Voyage [Boston: Robert Brothers, 1890], p. 258). RLS and Simpson now arrive in Pontoise where An Inland Voyage ends. Here, RLS stays at Hotel du Grand Cerf, Dubec-Lebreton, Pontoise. After leaving Pontoise, RLS heads to Paris and Grez where he meets Fanny Osbourne, the woman who will later become his wife, for the first time. Some critics disagree about when their first meeting took place, arguing it might have been before RLS and Simpson’s trip, in July 1876. Bradford A. Booth and Ernest Mehew in The Letters of Robert Louis Stevenson (New Haven: Yale University Press, 1995), however, make a good case for placing the meeting after the “inland voyage”, in September 1876. RLS was at Paris and Grez until 11 October and arrived home in Edinburgh on 16 October 1876.